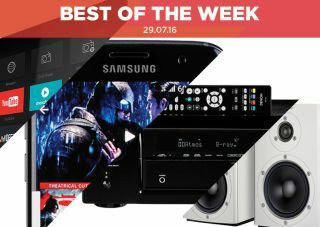 Best of the Week: Samsung Galaxy S7 Edge, Marantz Dolby Atmos receiver and more | What Hi-Fi? A round-up of stories to have featured in What Hi-Fi? this week, including news of new Dolby Atmos AV amp from Marantz and a review of Samsung's Galaxy S7 Edge smartphone. This week Marantz introduced a new Dolby Atmos/DTS:X compatible receiver, LG is investing in flexible OLED technologies and Loewe is set to release its first OLED TV. For reviews we had Samsung's Galaxy S7 Edge smartphone, Denon's AVR-X3300W AV amp and Dynaudio's Xeo 2 speakers. MORE: What is Google Cast? What speakers and TVs are available? Marantz's latest AV receiver features both Dolby Atmos and DTS:X surround configurations, has eight HDMI inputs and supports HDR, 3D and 4K Ultra HD video. Wi-fi, Bluetooth and AirPlay are onboard as well as support for Spotify Connect. It will go on sale in September of this year, price to be confirmed. LG is convinced flexible OLED displays will be the next mobile innovation, and has set aside $1.7bn to develop the technology. LG has previous experience with flexible phones in its G Flex and G Flex 2 and with the flexible screen market set to grow, it's looking to be the market leader. Loewe's Bild 7 will be the company's first OLED TV when it launches in September. It has 4K Ultra HD and High Dynamic Range (HDR) support, with Dolby Vision arriving soon after launch. There will be a 55in and 65in versions, with the cheapest priced at £4490. "Its screen is as gorgeous as ever too, and with a performance that blazes through any task we throw at it"
We were big fans of the S6 Edge, but the S7 Edge betters it in every way. The design is more refined: the screen is gorgeous, it packs in a powerhouse of a performance and the camera is one of the best we've used. The price is high, but the S7 Edge warrants it and could even tempt iPhone users. "If you want to take your budget home cinema set-up to the next level, the Denon AVR-X3300W will do just that"
Denon blasted out of the blocks with the AVR-X2300W and builds on that success with the AVR-X3300W. It has a powerful sound and bags of detail, expertly handling bass and able to steer effects "efficiently and precisely". An expressive and very entertaining surround sound amp, and one we can heartily recommend. "The Dynaudio Xeo 2s are a near-complete system in a speaker’s clothing"
Though the Xeo 2s look like conventional speakers, they are more than that. They have a DAC, Bluetooth receiver and digital amplifiers built in, with plug and play functionality and hi-res audio support. With a sound that's far from the compromised performance that plagues many wireless speakers, the Xeo 2s are a resounding success.